This entry was posted in My Art & Writing and tagged art, baking, beauty, Christmas, food, fruitcake, holidays, humor, illustration, love, poetry, prose, romance, thoughts, truth, whimsy. Bookmark the permalink. Beautiful work AnnMarie! Bad news the nurse said its going to be a long time before I recover from this bug but I got tons of meds and special handouts on how to take care of myself. I bought myself brownies it says on the handouts no brownies bland foods but exceptions can be made for a day. I hope you had a lovely day today and your book sales continue to ‘rise’ ‘rise’ ‘rise’! I promoted your book on my page. I will AnnMarie I will be good and actually do what the handouts say from now on. Of course I am thinking of you and your book. You have been a good friend loyal and treated me well anything I can do to lend a helping hand to get your book some more promotion I’ll do it. I want you to succeed. I am rooting for you. Those brownies are so damn good AnnMarie! I’ll go lie down now and rest watch my horror movies and work on getting well. Hope your tech difficulties resolve-I can think of nothing more frustrating! I just happened to see this post last night before I went to bed. I read quickly and … it took my breath away. I thought, I’ll get up and re-read and see if it has the same effect … it did, it does. AM, this is simply superb. The whole post. 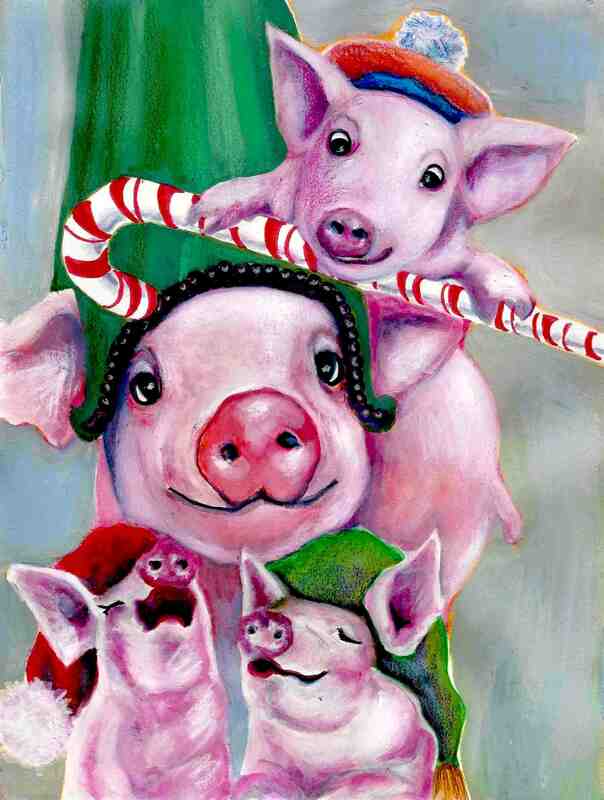 I think you know how much I love those peppermint pigs from way back (well, a couple years at least). Just looking at them makes me happy. But now, with these new words, well … this is a message that needs to be shared this time of year (and always). But it’s not just the “message,” it’s the writing: you know, I read these lines and I think, “This writer/poet not only knows what in the hell she’s doing, but she does it with confidence and determination.” Meaning: you should never, ever doubt yourself or what you’re doing (I know you do, we all do, but you, AM, need to start believing, need to “trust” in your own talent). Those lines–“a soul refreshed by winter moonlight / will shine for eternity”–is fuckingly beautiful. And looking at those sweet pigs and reading these stunning words–well, I have to say both warmed this reader–physically, mentally and emotionally–on one of the coldest of nights. I’m not kidding. Sorry to gush here, but sometimes gushing is necessary. Necessary for the reader, necessary for the writer.